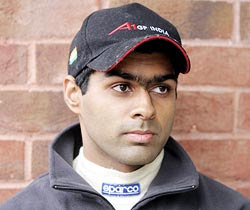 F-1 India: Chandok in Force India? According to latest reports, Mr. Vijaya Malya has been quoted saying that he would be the first one to offer Karun Chandok a racing opportunity on the F-1 racing track and the first car he would drive would be one of Force India. This statement of Mr. Malya is being perceived in a very affirmative manner by Indian fans who are desperate to see a Force India car being driven by An Indian driver rather than Liuzzi or Sutil. Chandok has been performing constantly well in the GP2 races that he has participated in. A debate on how Indian is Force India would have certainly reached Mr. Malya and he being the owner of a team that has performed extremely well in the previous race at Spa and with Fisichella's switch to Ferrari for this year as well as the next year, one and all are expecting Mr.Malya to recruit drivers like Narain Kartikeyan and Karun Chandok into Team Force India. Copyright 2009 : F-1 India: Chandok in Force India?